Sowerbaea juncea ‘Wonder Grass’ is a compact form of this Australian native grass selected for its special attributes. The flowers are borne each year at the end of winter. 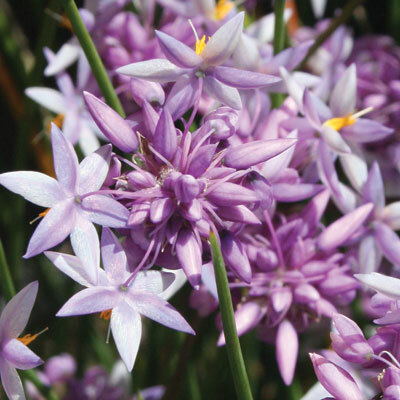 They appear firstly as dark lilac buds which gradually open to pale lilac star shaped flowers. Flowering lasts for eight to ten weeks. We recommend growing your plant in a container in a very lightly shaded place in your garden, on the deck or similar places around your home. In this use the plant does well from our experience over several years. ‘Wonder Grass’ should be grown in really well draining garden soils or kept in a garden pot. We recommend that gardeners grow their plants in pots for reliable results, good drainage is essential to grow ‘Wonder Grass’. In growing them we use slow release fertiliser and normal potting mix. Plants grown like this have done well with no losses. After the plant has flowered you are able to divide the clump to make more plants, this is easy as they grow away well. There have been no problems with insects or disease. Sowerbaea juncea grows along the eastern seaboard of Australia. They grow in sandy, open soils of the Wallum. Fields of Sowerbaea have many plants growing together. ‘Wonder Grass’ was selected from a field of several hectares of plants on the Queensland Sunshine Coast. Sowerbaea juncea has flower stems of 20-30 cm in height and each plant may bear as many as thirty stems. ‘Wonder Grass’ was selected for its compact growth habit, flower stems are up to12 - 15cm in height and there are just as many flower stems making the plant stand out in the field. After tissue culturing these plants are now available for gardeners.